Get Your Business Online In Just a few minutes! It's as simple as that. Who can sell on Acchajee? Acchajee is a Business-to-Consumer(B2C) shopping platform. If you are a manufacturer, a brand owner, a retailer/reseller, a franchise holder, a distributor, a professional artist/artisan or a trader, you can sell on Acchajee. It's simply for everyone, and the best part is, it's totally free! More features to watch out for! We are always here to assist you, you are only one call/text/email away from us. Promote your brand by making combos, deals, offering discounts, creating coupons exclusively for your shop. You don't have to worry about product uploading, we would love to do this for you. Just let us know that you are interested in selling. Rest is our work! 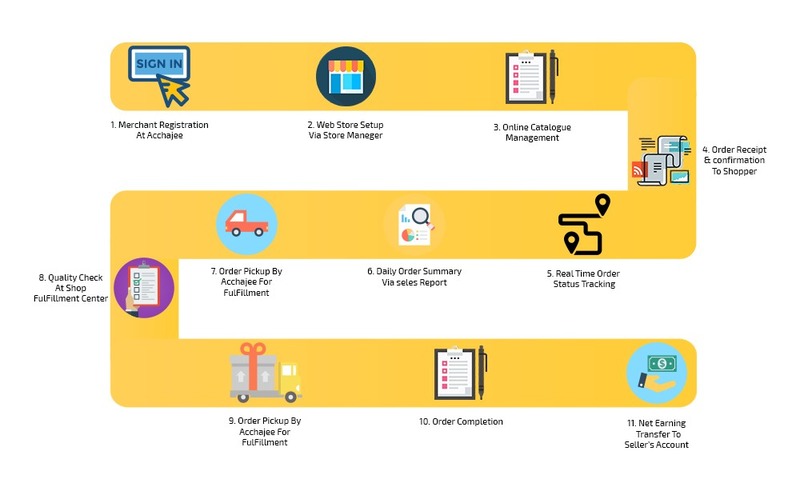 Track and analyze the performance of your Acchajee store with our seller panel and get access to our seller community to help grow your online business. Acchajee is your one-stop destination as a seller portal, where you can sell products online. Expand your reach to millions of online customers and scale your business to greater heights with these simple steps. 1. Who can sell on Acchajee? 2. How can you register as a Vendor on Acchajee? Please visit Acchajee Signup page and follow the step-by-step process to sign up. Note that only after our verification process is complete, you can start selling through your online store at Acchajee.com. trace the order online with the carrier. 3. What do you need to start selling online? After that just have to fill a small Registration form, That's it. 4. How can you manage my online store at Acchajee? After you’ve successfully registered, you will have complete controlling access to your online store at www.shopping.acchajee.com/---xyz_store_name---. You can log in anytime, anywhere, using an Internet connection to upload new products, change existing quantity or pricing, manage orders & inventory, along with several other benefits. 5. How can you upload your products online? 2) Bulk Upload, using a CSV file. Note: - As we would love to decrease your work, that's why we are here to upload your products without charging you a single penny. It's totally free guys. 6. Who manages to ship at Acchajee? It's all up to you, if you can manage to ship from your end, then you can handle it in your own way. If not then as we said earlier we are always here for help you. You just need to pack your product; our guy would pick and ship the product. 7. Who provides the customer service? Acchajee provides all the technology, payments, returns and pre-sales/ point of sale services. The entire post-sale services are to be provided by the merchants. 8. Who does the customer contact for post-sales services? The product related issues are to be handled directly by merchants. Acchajee is not equipped to handle any product or manufacturer related issues, repairs, maintenance and/or services. We accept COD, Net-Banking, Visa, MasterCard, and American Express credit and debit cards for your convenience.